It wasn’t Anzac Day ten years ago when I was waiting for my train on the southbound platform at Wollstonecraft station on Sydney’s North Shore. But I’ll remember Anzac Day to you now because there was a kindly looking old man in a Digger’s hat selling paper poppies from a box that day. It was a pretty November morning, and the jacarandas were littering the platform, as is usual that time of the year. Maybe it was the sight of the purple flowers that prompted me to go buy a red paper one from the old Digger. When I did, he asked me where I was from. 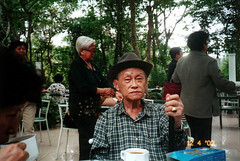 And when I said ‘Singapore’, he said to me in Hokkien, ‘Li Ho Boh?’ (How are you? ), and ‘Selamat Pagi’, in Malay. ‘I was at Changi and at Selarang’, he explained, responding to the big, silent question mark on my face. Pity my train came uncharacteristically on time, or else I would’ve loved to have talked at length about his time in Singapore. That Digger’s story is part of our history, and like a lot of things to do with our history, we’ve got to rummage around our spanking new National Libraries’ archives/vaults/depositories before we can hear these important voices. I second mr brown’s proposal to bring these voices to the fore. It will be interesting. And at the very least, we’ll see that our history isn’t mired geographically. the mr brown show April 27th 2005. Or via subscription here. iTunes’ party shuffle is playing a copy of: Never Broken – Cassandra Wilson – Traveling Miles, of which I have the original CD and therefore didn’t steal music. I’ve been spending more time than usual at Holland Village, and at one of my favourite coffee shops. The one that sells roast pork, chicken wings and pretty decent drinks. 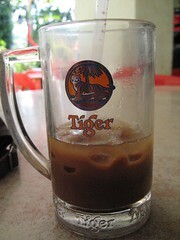 A few afternoons ago, I sat there nursing my second Tiger mug of iced coffee because I had been thirsty enough to order but not drink two. At 2.30 in the afternoon, Holland Village, as you know, is still pretty busy with slow moving cars and slower moving people. And it was such a blazing afternoon, people were moving even slower than usual. Even the Jack Russell terriers being taken down the street to the vet/petshop weren’t as spritely as they ought to be. And as you know, Holland Village is always chock full of Ang Mohs of all nationalities. So much that the anti-terrorist barriers are still in operation between 7pm and 7am on some of the more popular Ang Moh streets, where Coffee Leaf and Tea Bean and the likes are located: “There will be no terrorist activity between 7pm and 7am on these streets because the terrorists are not allowed to vault over this flimsy metal gate between these hours”, says a sign that doesn’t exist. But ought to be there. So terrorists would know. Bombing is not allowed. There is a gate. It is locked. But anyway, that afternoon, at the coffeeshop with me were two Ang Moh men, sitting at separate tables, minding their own business, which wasn’t much. The first man was seated facing the back of the second, and was mulling over his Tiger mug of Tiger, and the other, seated one table away from the first was poring over some book. Then it happened. The second man leaned to his left so that half his backside was off the plastic chair. And let out a god almighty audible fart. It was a toot long and loud enough above the traffic noise to startle himself and the people at the coffeeshop. There was a very pregnant pause as everyone, coffee stall owner, charsiew, roast pork stall owner and chicken wing man, all turned towards the direction of the sudden noise. The Ang Moh sitting behind the Tootler was already choking on his Tiger trying to stifle his giggles. Then everyone burst out laughing. The poor bugger-who-thought-this-big-one-would-be-a-silent-stinker sat frozen, probably not able to decide whether to acknowledge his audience, or get up and flee. Sorry. Reflex. Nothing to do with this post. Not bad though. the mr brown show 26th April 2005. Or via subscription here. iTunes’ party shuffle is playing a copy of: tmbs-050426 results may vary – mrbrown – the mrbrown show, of which I have the original CD and therefore didn’t steal music. Funny lah! One day keep fit, keep fit, next day sick as a dog. I’ve got a flu and a secondary ear infection that’s disrupting my balance, and that’s not good in my line of work, because I don’t know if I’m flying the damned airplane level or not. And you know how that is. Not good for the passengers either. “Raydees and gentremun, due to asspeerians tahburance, prease keep your seatbeowt fastened and refriend from using the rubber trees* ” ~ real in-flight announcement on All-Nippon Airways. iTunes’ party shuffle is playing a copy of: Respect – Aretha Franklin – The Very Best of Aretha Franklin, Vol. 1, of which I have the original CD and therefore didn’t steal music. There is a village on the south east of the island which has been, like most other villages on Hainan, converted into a tourist attraction. It was about the only place my cousins and I thought interesting (whereas my uncle was stoked by everything he saw everywhere, buying all manner of coconut-related rubbish), and were especially tickled to see signboards in what my cousin called ‘P. Ramlee Malay’. The interesting thing about this village is that it showcased customs and cuisines the Hainanese returned emigres brought back with them from Southeast Asia. Called Xinglong Overseas Chinese Farm, near Wanning town in Wanning County, it was a model village built by the Communists, and where Zhou Enlai had urged ‘Nanyang’ Chinese to resettle back in the 1950s and 60s. So when the tour van spilled us out into the village, my uncle, Datuk Uncle Y. Y. Lee, took it upon his goodself to inspect the little stalls making kaya and coffee powder, since it was well known that he made the best coffee and kaya and various types of confectionery in the whole state of Negri Sembilan in Malaysia. He stabbed at every stall (and sometimes stallholder) with his walking stick, asking the stallholders how long they fried/roasted the beans, how much sugar they put in the kaya, and how come they didn’t put pandan leaves in it. Then he gave, yes gave freely, his secret to making the greatest tasting coffee-shop coffee in the universe (Seremban), whispering almost, that you had to fry the beans with sugar, margarine, pineapple husks and peanut shells. After being treated to a Javanese-Hainanese dance and trying to prevent the Datuk from accumulating more coconut paraphernalia, we were taken to a rather nice looking resort-style hotel called the Kangle Garden Resort. Only it only looked nice, and we spent the night being eaten alive by mosquitoes while we planned how to get to our ancestral village. My cousin made a call to a relative in the village, (yes, we never learn to call ahead earlier) who, like everyone else on the island, said the town (Kachek) our village was close to was close to where we were. Double checking the two very different maps I had, I found otherwise. But still, at least we knew roughly where to head, and decided to pay the tourbusvan driver to abandon the other tourists and take us to Kachek the next morning. He agreed. iTunes’ party shuffle is playing a copy of: Huri huri – Kiri Te Kanawa – Maori Songs, of which I have the original CD and therefore didn’t steal music. 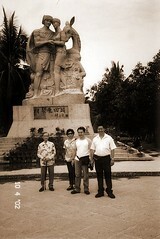 This is a continuation of my blog post about Hainan Island. ‘Short the distance, together the people’ is Hainan Airlines’ tagline (while you’re there, check out their subsidiary Deer Jet and their flashy website), and Hainanese Chicken Rice doesn’t come from Hainan. Over the next two days of the tour, we were taken to one ethnic village after another and conned into parting with our RMB to watch insipid dances by ‘ethnic minorities’ who strangely spoke Mandarin instead of their native languages. The Lees (Datuk Y.Y. Lee, M M Lee, Miyagi Lee and S K Lee) after watching one of the Miao (I think) ethnic dances outside the Miao Village Li tribe tourist village. On the third day, I decided to ask my cousins (who organised the trip) how we were planning to go visit our ancestral village. I had assumed that everyone on the bus came from (or descended from) the same village, and the village must have been some tourist attraction as well, complete with my relatives doing insipid dances and asking us for money. It’s fun being wrong, especially when you’re on a trip to some place you’re hardly familiar with. My cousins were just as clueless as I was, and had no idea where the village was, only that it was half an hour out from this city called Kachek in Hainanese, and we had no idea what the Mandarin name for the place was. I was marginally more prepared. Dad had given me several photographs of Kachek, including one of a four storey building in Kachek he had donated money to build. It had several distinguishing features, one of which was the name of the building, named for one of my long deceased relatives. Armed with that and what Dad helpfully told me: ‘Our village is near where that American spy plane crash landed’, I felt I’d be the one to lead me, my cousins and Dad’s brother on the mission. We spoke to the tour guide, who was still talking about herself when we asked her where Kachek was. After spending two whole days with her incessant chatter, we didn’t think it was too rude to just walk away mid-spiel and try talking to the bus driver instead. He turned out to be our first real lead. He was Hainanese, and he knew Kachek, and that it was called Jiaji in Mandarin, and that it was located in Qionghai County, which my father and his brother both had referred to as Khkhkhkhkhenghhhhhaii in Hainanese with a lot of phlegm. iTunes’ party shuffle is playing a copy of: Feels Like Rain – Buddy Guy – It’ll Come to You: The Songs of John Hiatt, of which I have the original CD and therefore didn’t steal music.